It's hard to find shows to watch with the kids right now. At 10 and 7, their tastes and ours don't mesh very often. So we were excited to hit on something that we could all agree on: MasterChef Junior. Bob and I have been watching various Gordon Ramsey shows for years, particularly relishing the uncensored British series, which made it hard for us to imagine he could tone down his famously pottymouthed persona for such young competitors. MasterChef Junior gives the best junior home cooks in America the chance to showcase their culinary abilities and passion for food through a series of delicious challenges. 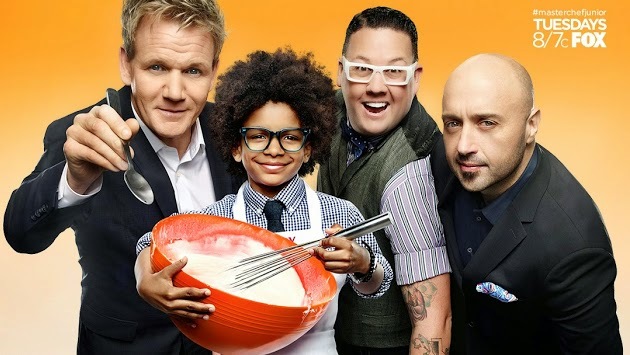 Each episode, host and award-winning chef Gordon Ramsay is joined by restaurateur Joe Bastianich and acclaimed chef Graham Elliot on the MasterChef Junior judging panel. The season premiered on Tuesday, January 6th with 19 contestants showing off their kitchen skills. These kids made their own pasta, then created sauces for them. From scratch. For real. And with enviable precision and spectacular plating. We were duly impressed. The kids are all amazing and Gordon is remarkably sweet with them. The whole show makes you want to get into the kitchen as a family and practice chiffonades, or something. MasterChef Junior Season 3 airs Tuesdays at 8/7c on FOX. To celebrate the season, they've put together ‘warm winter’ kits containing everything you need to bundle up with family and whip up a steaming cup of decadent hot chocolate to settle in for a night in front of the TV watching America’s most talented young chefs. In addition to a selection of ingredients to make your own gourmet hot chocolate, the kit will also include recipes for delicious as well as a blank recipe card so you can jot down your own family favorite or let the show inspire a new masterpiece. I am rooting for Kayla. I am rooting for Riley. I'll root for whoever is the most dedicated. We are rooting for Kayla! This season we are rooting for Riley! Thanks for the chance at this! I haven't watched it at all, but I'll say I support whoever gets the most creative! I love when you can see kids coming up with ideas all on their own. Their creativity is so much fun!